My review of The Saboteur is up now at thephoenix.com. Given the unceremonious closing of Pandemic Studios, and my low regard for many of the developers' past games, I was surprised by how much I enjoyed it. It shows the extent to which one good idea, well delivered, can often make up for rough execution in other areas. Criticizing a game's missions as the weakest part of the experience sounds a little strange, but I got a great deal of enjoyment from not trying to power through The Saboteur. Even though the story is pretty good, ultimately nothing beats blowing up Nazi machinery. 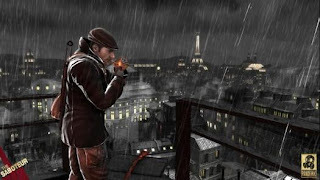 Playing The Saboteur after Assassin's Creed II made for an interesting contrast. They have much in common: open-world platforming, oodles of side missions, similar mission structures. ACII is probably better at the things it does well than is The Saboteur, and it is the more polished and ambitious game. But it's also so convinced of its own importance that long stretches of it are ponderous and dull. The Saboteur is more even-keeled, never truly great but never boring, either. In a way, that's better. This game knows what it does well and generally sticks to it. In both cases, I'm glad to be playing more games with interesting settings, and not stock sci-fi or fantasy worlds. I've not truly been sold in the past on realistic renderings of modern-day cities, even as impressive as GTAIV's New York was, but Renaissance Italy and an impressionistic intepretation of Nazi-occupied France are both places I've been more than happy to spend time in. More like this, please. All I needed was realistically rendered Nazi-occupied Paris and I want it... So I run straight to Steam and IT'S NOT THERE! Would love to see the piracy rate on this one. Although I liked Mercenaries 2 (but not the original), it was very flawed and broken and it's story was trite and inconsequential. Having said that, I really like The Saboteur. I actually find it amazing that the same developer made both games! The Saboteur does have some flaws, but overall it feels very polished, is a beautiful game with responsive controls and well thought out game systems. I like the mission based structure but like Mitch I find myself just wreaking havoc, getting into trouble and then getting out, wandering on foot or spending far too much time trapsing around roof tops. I hope The Saboteur sells well enough and that people give it the praise it deserves. I'm not a fan or either Assassin's Creed, Infamous, or Prototype, but I'm a big fan of Pandemic's swan song. Oh, I'm glad to see someone finally paying attention to this. I love the idea enough to forgive some flaws in execution, but I'm led to believe that the PC version is pretty much completely broken. Alas!